Two significant events will take place this week and cyber activists need to take note and pay attention. This will be your training on how to unfold the growing revolution that is spinning our world on a new and courageous path. First, Julian Assange has completed filming twelve episodes of his forthcoming show, “The World Tomorrow”. The first episode will be aired on RT and released online on Tuesday 17 April 2012, with other networks to follow. “The World Tomorrow” is a collection of twelve interviews featuring an eclectic range of guests, who are stamping their mark on the future: politicians, revolutionaries, intellectuals, artists and visionaries. The second event, Nobel Peace Prize nominee, and political prisoner Bradley Manning’s next appearance in court will take place April 24-26 at Ft. Meade, MD. Bradley Manning was arrested in May 2010 in Iraq on suspicion of having passed classified material to the whistleblower website, WikiLeaks. He was charged over the following months with a number of offenses, including communicating national defense information to an unauthorized source, and aiding the enemy, a capital offense. Why are these two events so significant and why should every person behind the moniker “Anonymous” “LulzSec” “Hacker” and “Hacktivists” sit up and pay attention? They play one of the most important roles in making our army of cyber warriors ready for what is necessary to bring the change needed to the world that will take down corporate controlled governments and oppressive corporations that are exploiting the middle and lower economic citizens, and restore democracy to an ever growing Facisists learning world governments working feverishly to crush the rights of all people. For the countries that will not allow physical torture for activists and outspoken political warriors, they have ACTA, SIPA and now CISPA. As the Editor of The Hacker News my Facebook page is “friended” by thousands of people worldwide who want the same thing, freedom and respect, I am seeing a disturbing and what I fear an eventually failing process that must be corrected. Thousands of people are using the important tools of social media to gather and express their anger and disgust at their corporate controlled governments and corporate control. This is good. We are building a foundation of soldiers who will eventually take up cyber arms to hopefully bring the necessary change. Still, knowledge is power and I see a great need for people interested in making a difference needing to understand the basic and fundamental issues and what is truly at stake if we do not take action. “The World Tomorrow” must be watched to give everyone an understanding of what is actually happening to our world which will be brought to us by leaders and educators that can inspire us and teach us truth. Truth is something that has been sorely missing in the corporate controlled media and our governments/Corporatocracy, that are fascists leaning and rife with greed and hidden agendas. 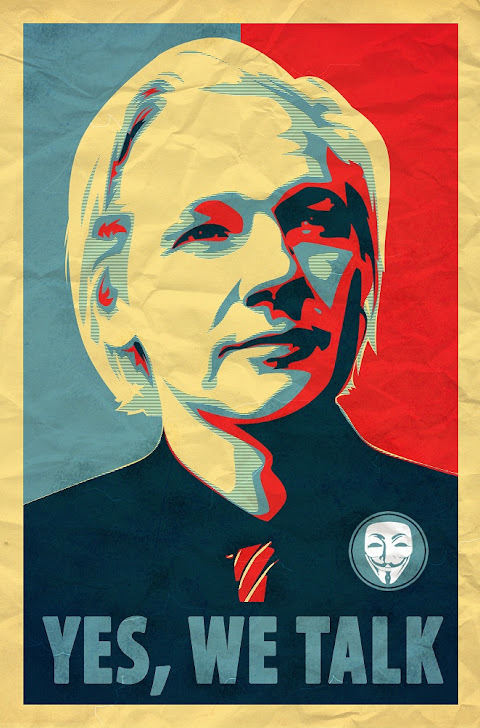 Watching gives you some power to support Julian Assange as it should make you flaming mad that an unlawful financial blockade (http://www.wikileaks.org/Banking-Blockade.html) by a cartel made up of VISA, MasterCard, the Bank of America, Western Union and PayPal, prevents you from making a financial supporting donation because they don’t like him. Let’s just go back to burning books and people at the stake. When it comes to Bradley Manning sending in emails, signing petitions, voicing support, posting on your Facebook page, or giving financial support is so very need for his safety and ours. This is one of the most egregious, outrageous, slanderous, actions of our government to suppress our right to know. The case is once again reminiscent of the prosecution of Daniel Ellsberg for leaking the Pentagon Papers and faced up to 115 years’ incarceration. The bizarre and unfair behavior of the government in the prosecution of Bradley Manning likewise offends a sense of justice and has incurably infected the possibility of a fair trial and a just result. Short of outright dismissal it is hard to see how justice can be done. The other issue and what I see as far more alarming, is the need for people to have something to do to create this change. One only needs to look at history to see that any army devoid of tactical training and specific tasks will eventually wander off and go back home defeated. Here is where I make a call not to the thousands of willing participants who want change but to the seasoned an experienced Anonymous, LulzSec, Hackers, and techies to organize some sort of “cyber training” that will teach our comrades how to do the job. We need people to perform more than just DDOS attacks. We need a trained army of cyber warriors who know their keyboard and know their weapon.